A whole new 3D world rendered on an Amiga, admittedly, with no tactile feedback. But still, we were impressed. Virtual reality was clearly the future of gaming. Except it wasn't. A mix of unimpressive games and phenomenally expensive kit quickly put an end to things. The technology simply wasn't good enough – not just the VR, but also the computers that were serving up the games – and mainstream interest started to fade. We've dived into the archives to bring you this collection of some of the other game-changing technologies that never had their shot. In many cases, they were technologies ahead of their time. In others, they were simply bad ideas, getting attention only because of media hype and big names like Microsoft being slapped onto the title. Gaming technologies tend to be the most exciting innovations of all, even if few of them actually come to pass. The 3DO Blaster was a particularly interesting one – an ISA card that, when coupled with a specific CD drive, would turn your PC into a fully-fledged 3DO. What's a 3DO? Exactly. It was a major flop as a console, with few genuinely memorable games to its name. The concept of being able to literally turn your PC into a different machine was an interesting one, however. Of course, virtualisation and emulator tools mean that that's now possible in other ways. Sadly, we all had to wait over a decade for the tech to catch up. Nothing's beaten them yet, but there's a long line of corpses from systems that tried. Speech recognition, new ergonomic layouts, trackballs, tablets... it's only with multitouch that we've seen a system that actually stands a chance, and even then, it's not going to take over for precise control. As for keyboards, QWERTY is king, no matter how much Dvorak fans still protest. The closest we've seen to a reinvention there is the splitdesign for RSI suffers. All the other designs, from foldout cloth keyboards to snazzy laser ones that project onto your table, simply haven't picked up steam. Unlike many of these technologies, physics cards were clearly doomed from the start. The basic idea stemmed from the classic maths coprocessor found back in the days of the 386 – which bolstered the computer's maths ability for complicated calculations – and the now standard 3D graphics accelerators. The problem was that changing the physics of a game will always be a much bigger issue than working on the graphics or other elements, meaning that companies wanting to use a physics card were limited to things like bigger explosions or isolated clutter instead of widespread game changes. Without mass acceptance of the physics technology, no games were written to take advantage of it. And without the games, there was no incentive for users to buy the hardware. The solution? 3D graphics accelerators taking over. And indeed, this is what's happened, leaving the dedicated physics cards behind. Love or hate Windows, it's the only game in town. 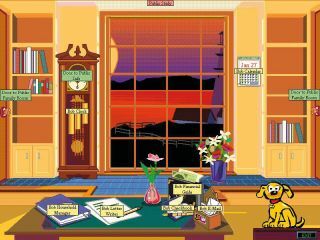 Failed attempts to change the metaphor have included the friendly Microsoft Bob (which turned the desktop into the rooms of a cartoon house and put a smile on it), similar projects like the Packard Bell Navigator (same idea, less cartoony) and, worst of all, the 3D desktops. Oddly, nobody wanted to wander around something like the infamous 'it's a Unix System' scene from Jurassic Park, or have every application on different sides of a cube. Microsoft did finally bring us 3D desktops in Vista, but only to harness the power of modern graphics cards in order to deliver a slicker 2D interface.